Friends of Himalayan Sherpa People, Inc. 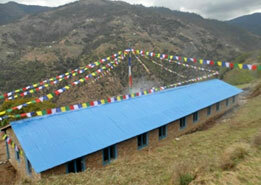 Welcome to Friends of Himalayan Sherpa People, Inc. a 501(c) 3 non-profit organization! FHSP works in partnership with Sherpa people in remote villages of Nepal to build schools, health clinics and conduct workshops on natural resource and wildlife conservation through environmental education. Our current project is to build a school to provide children with much needed education and a health clinic to help ease their medical needs in Phapre Village in Okhaldunga, Nepal. The sustainable health of the people and the land are so intertwined, we also work for natural and cultural preservation of this rich heritage of people and the natural forests, flora, fauna, and watersheds that support all life. We hope to find ways to address the challenges of our rapidly changing world, socially, and with a warming climate, to support the quality of life for this traditional culture in balance with the modern world. Enjoy reading what we have been able to accomplish thus far and join us to successfully carry out the charitable projects we have mentioned on our website under our projects. Copyright © Friends of Himalayan Sherpa People, Inc.
Friends of Himalayan Sherpa People, Inc. is a non-profit (501(C) 3) organization.